Occupation: Pilot of the Amelia Gay and Disgruntled Malcontent at Large. SHE CRASHES INTO THINGS. As a pilot, she's decent enough in the air but proper landings are for weenies who paid attention when their mentally-unstable grandfathers were teaching them to fly. 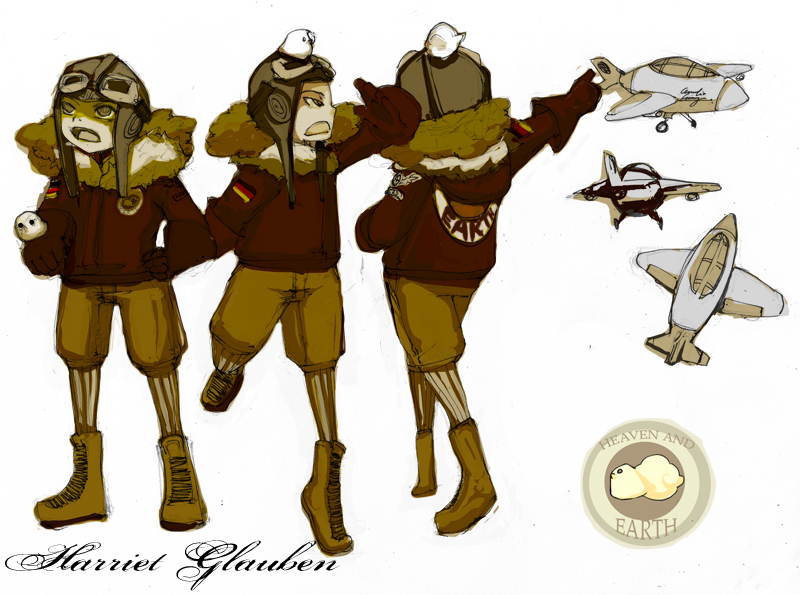 Her jacket and her plane feature a Heaven and Earth logo, a informal family crest that's been passed down for generations and modified by Harriet from a eagle soaring majestically across an open sky to a baby chick flopping about in front of a puffy cloud. The essence of fear. As a person she's generally unpleasant and swears liberally, a trait picked up from her aforementioned perpetually angry, ruddy faced, German grandfather. A grandfather, who has died recently, leaving a misplaced inheritance that Harriet believes entering the SDT will be a shortcut to finding. The chicky's name is Zickel. He gets in the way.